for SCI Trainee EO vacancies. There are total 40 Trainee Electrical Officers Jobs in SCI. Applicants having eligibility criteria can apply online from 23-07-2018 to 24-08-2018 for these jobs AT SCI Head Office Mumbai. Online exam and interview dates for this SCI Trainee Electrical Officers jobs is announced later by SCI. Selection of candidates for SCI Trainee Electrical Officer vacancies is based personal interview. 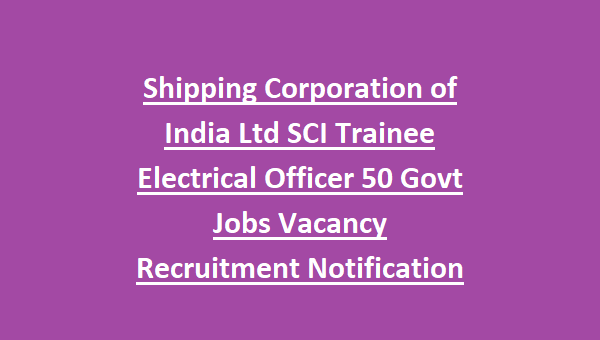 For Vacancy details, Age limit, Qualifications, Pay scale and other details of Shipping Corporation of India Ltd SCI Trainee Electrical Officer jobs recruitment 2018 are given below. Click here to see the official notification of SCI Trainee Electrical Officer Recruitment. 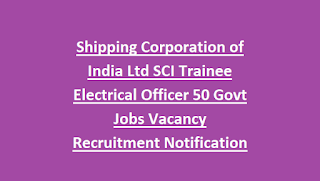 Organization: SCI Shipping Corporation of India Ltd.
For SCI vacancy details please go through the official notification given below. Upper Age limit of the candidates applying for these SCI vacancies is 30 years as on 30-08-2018. Age realaxation for OBC candidates 3 years and for SC/ST 5 Years. Candidate selection for the SCI recruitment is based on performance in online test. Candidates who are qualified in online test and based on marks merit list will be prepared and those candidates only called for interview. For final selection list after interview candidates are requested to regularly visit SCI website for updates. Application fee is Rs.1000/- for General and OBC, Rs.250/- for SC/ST candidates. Candidates have to pay the application fee through NEFT. NEFT details are given in official notification. Eligible candidates can submit their application form online through official website of SCI India @www.shipinida.com on or before 24-08-2018.